The Summer of Sonic Convention is 10 Years Old – Happy Anniversary! 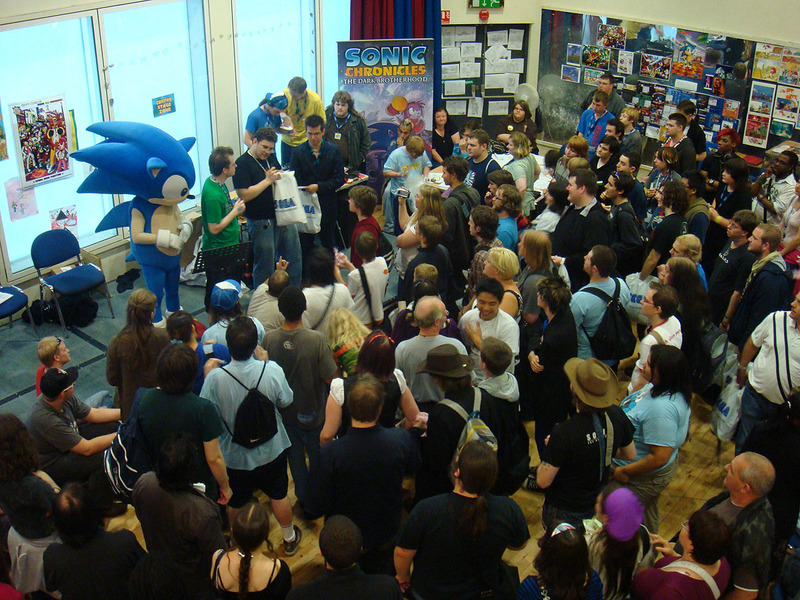 On Saturday August 9 2008, three young British figureheads in the Sonic the Hedgehog community opened the doors to the very first Summer of Sonic convention, welcoming over 300 people into a tiny hall with nothing but a SEGA Mega Drive in the corner and some cupcakes to entice them in. Fast forward eight years, to Saturday 6 August 2016, and those same three (now old) community veterans reunited for One More Run, wrapping up the seventh Summer of Sonic to a live audience of over 1,000 fans from all over the world. Attendees got the chance to meet Sonic co-creator Yuji Naka, play Sonic Mania a year before release and enjoy two electric music performances from Jun Senoue; firstly as a solo act and then later with Johnny Gioeli as Crush 40. Depending on whether you went to the first or the most recent one (or both! ), there’s a good reason to look back fondly on the Summer of Sonic event this past week. It’s been ten years since the first show, and two years since the last – and although it’s clear to see the differences in size and spectacle between 2008 and 2016, one thing stayed the same: the deep community spirit that drives the convention itself. I created the Summer of Sonic convention concept shortly after a chance community meetup in London back in 2007. After chatting with the concept to Kevin Eva (aka ArchAngelUK, who had recently joined SEGA as one of the company’s first ever community managers), we set plans in motion to organise and set up Summer of Sonic 2008. I found the venue (the cute Dragon Hall Covent Garden community centre) and funded the show, while Kevin handled some cool SEGA-based incentives (Guinness World Record association for a Sonic 2 speed-run, Nintendo DS prizes, Mario & Sonic game booths). Adam Tuff (known as T-Bird) provided some help with the music offering, setting the stage and making sure the acoustics were good for special guest Richard Jacques to perform live for the crowd. In the years that followed, Adam, Kevin and I (with a lot of help from a group of incredibly important volunteers and community pals who would keep the entire show running smoothly) would go on to improve on the formula; finding bigger venues, inviting more guests, diversifying the music experience, forming closer ties with SEGA… by 2010, Summer of Sonic really solidified itself as an important tentpole in the Sonic community. That year, SEGA provided pre-release demos of Sonic Colours and Sonic the Hedgehog 4 Episode I, and worked with Nintendo to film a segment for the Wii Channel. 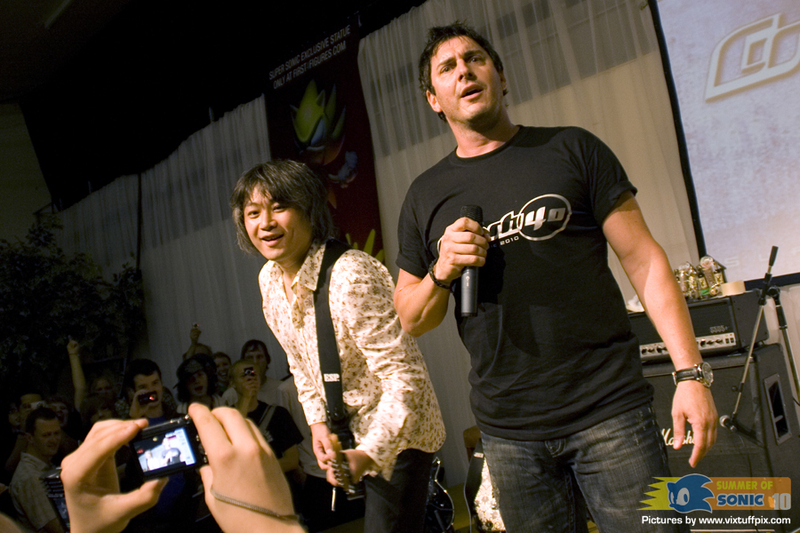 It was also the very first time Crush 40 – Jun Senoue and Johnny Gioeli – performed live outside of Japan. 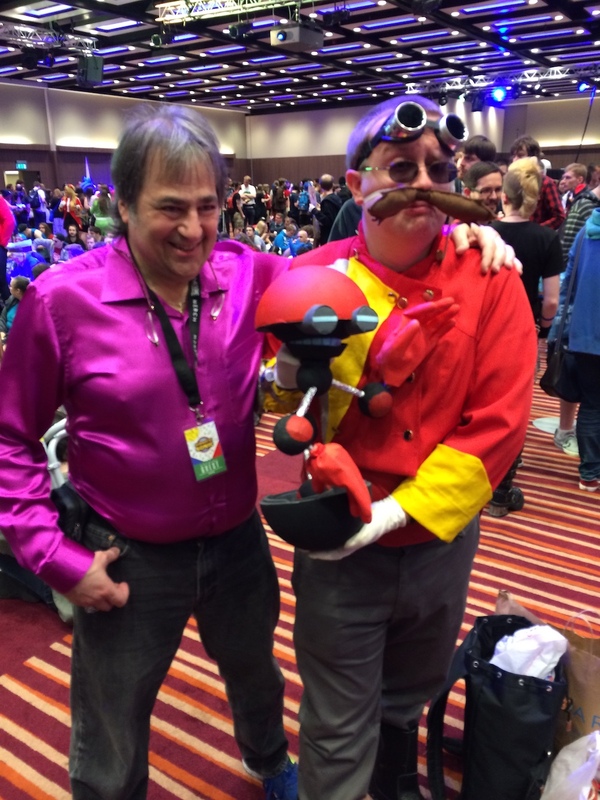 Meeting many a cosplayer, including a kid in 2013 who dressed up as an Orbinaut (complete with spiky hands) and a Boba Fett/Amy Rose mashup in 2016! Being forced to do the Donkey Kong Rap live on stage with Rory (aka Roareye – the co-host for many a Summer of Sonic) in 2008. No, I’m never doing it again. And obviously, the biggest and most fondest memory of all is just meeting all the Sonic fans who attend the show. It’s a delight to chat to every one of you and it’s amazing to hear how the existence of the Summer of Sonic has helped a number of you too. At the end of the day, I created the show because I wanted to make new like-minded friends, so to see others doing the same really makes me proud. To that end, the core mission of Summer of Sonic has truly been accomplished. 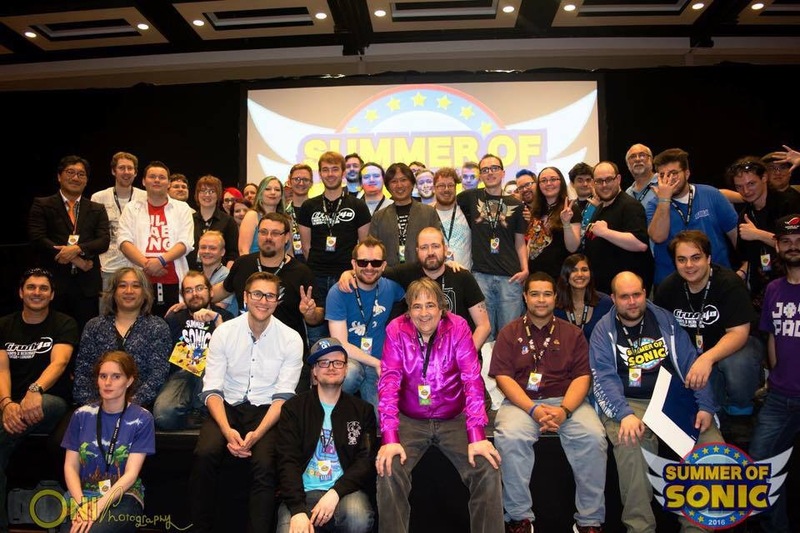 Thanks to all of you for helping make Summer of Sonic such a memorable event, thanks to all the special guests we have had over the years (including Richard Jacques, TJ Davis, Lee Brotherton, Sumo Digital, Jun Senoue, Johnny Gioeli, Takashi Iizuka, Yuji Naka, Julien-K, Kazuyuki Hoshino, Tom Fry, Tyson Hesse, everyone from Fleetway’s Sonic the Comic, Ian Flynn, Tracy Yardley, Mike Pollock, Duncan Gutteridge, SEGA Hardlight) and most of all thanks to all of the volunteers who have made the show what it is every year. Happy Anniversary, Summer of Sonic! I think there needs to be a “2nd run” in the future! Loved the Summer of Sonic events…thanks so much for all the hard work that went in to them from you all. While I had only attended the most recent One More Run event [and watched the 2013 livestream], I can certainly say that it’s great fun to be at and see everything going on. Unfortunate really that I never actually interacted with anyone, but I’m certainly hoping to do so if ever another Summer of Sonic happens. It’s certainly a great atmosphere to be a part of. Man, I am feeling old! Succeded in saving up money to go two times, 2009 and 2011! I had a blast! Been thinking of starting a Sonic convent in Sweden but not sure if there are as many fans here in Sweden and also I probably would not succeed since I have no talent to fix something like this. Kudos to everyone that worked on Summer of Sonic and to everyone that attended! Like to watch the Summer of Sonic streams. I’ve had the pleasure of going to every single Summer of Sonic and I have no hesitation in saying that it has changed my life in so many ways. I’ve made friends from all over the world (culminating in a 3 week road trip in Canada and America in 2014 to meet some friends I met at SoS) and friendships that has lasted to this day and are just as strong as the first day we met. I can’t believe it’s been 10 years…man I feel old haha! First and foremost a mega Sonic congratulations for the incredible achievements both you and the team of key members, volunteers, supporters and fans have attained over the decade. To have brought smiles to every person who stepped into the convention each year is a testament to your vision and commitment to the initial concept of a get-together among people who share a common interest in the speedy blue hero. Secondly it has been a pleasure to have known you, your family and the circle of awesome people that has made my time enjoyable and an inspiration to others in being a proud Sonic fan. Keep up the awesome stuff mate, I shall never forget our initial meet up back in King’s Cross St. Pancras Underground Station in 2007, I managed to meet you and your brother Roareye for the very first time, followed by our fellow friends Adam Tuff, Lewis Clark, Mike Taylor and others at the pub later. And one final note, as I’m working away happily on my graphic novel at my very office, to this day, I’m still listening to ‘The Sonic Hour’. In fact I’m on an episode where the T-Bird first debuted as a guest (via ‘The Sonic Arabian Hour’ – 04-03-2007). It never gets old for me.